It’s always worth attending at least one of the days. Stick Figure must be killin it. I am still unfamiliar with their sound and just don’t have the interest to even search for their material. Maybe I’ll give them a listen..
Edited 2 time(s). Last edit at 10/15/2018 03:04AM by Ras Matches. On-site “glamping” only $1,500. What a deal!!! Yeah what do they think this is ? Burning Man? Edited 1 time(s). Last edit at 10/30/2018 12:23AM by Ras Matches. Unless they're adding more artists, that's a weak lineup for a 3 day fest IMO. Ahh...didnt go to link, just looked at poster. Cheers! Sunday looks like the day. Definitely not enough there for me to make the trip from Portland. Edited 1 time(s). Last edit at 01/11/2019 08:05PM by Ras Matches. not even interested, nor interesting. From what I've heard, most of these listed names might be playing smaller venues in the area around that time still to be announced: Kabaka Pyramid is at Moe's Alley February 17th! I think I'll check a few of these reggae names that way this year & leave the fest to the Valley metal fans again. 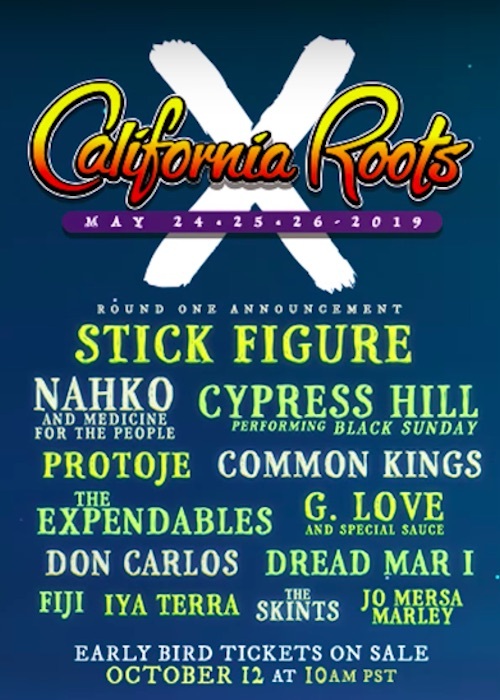 I haven't seen Cypress Hill live in years- that sounds like a fun set to me! I have always watched parts of Cali rock fest at home from the live stream. Maybe that will happen again? ‘Valley metal fans’ , I am admittedly from San Jose and also a fan of metal music , but I cant count how many shows I seen you spin Spleece. It’s a little hard not to take your comments personally. There’s no metal music on this bill , Cannibal Corpse is next month and Erykah Badu was last month but I guess that’s not metal. Edited 2 time(s). Last edit at 01/12/2019 05:48PM by Ras Matches. also it seems this fest is almost always a repeat of the same bands over and over and over... into infinity, it seems. What would the artists themselves say? I went a couple of days last year and had a good time. Saw the targeted artists, & got my reggaefix. E40 did a banging set, too. Great, positive vibes all around in a good venue, with happy&stoked people all grooving all the time...while I was there. Nothing wrong wit dat. Sure the lineup was not everything I dream of. Those dreams are now just memories from days gone by. They don't happen cause the artists I really wanna see are universally older, infirmed, or dead. BUT it's a solid, well run festival. Spendy, but reliable. Not planning on going this year, but I gotta give it up to amy and dan @ CaliRoots for keeping some fyah burning. Edited 1 time(s). Last edit at 01/13/2019 06:35AM by Jahsprey. It's noting personal Jah Matches. I love San Jose- it's where I often go when I want something good to eat & to visit my many friends & family there. There are many 'valleys' in Cali, but I never think of San Jose that way: your associating my description the way you have actually surprised me at first, but I do understand it. I only have my own experience to draw from: the valley I was actually referring to is the Central Valley (Fresno area), where I spent the first 34 years of my life prior to moving to the coast 11 years ago. Fun fact: I only discovered reggae about 28ish years ago- prior to that, I WAS a Fresno 'valley metal head.' I had seen Metallica seven times live prior to turning 18 years old (even during their 'Puppets' tour), Slayer at least ten times, Pantera, Sepultura, etc., have water skied with Suicidal Tendencies at Milllerton Lake twice, partied with Korn who was born & grown just an hour from my home town, remember Z-Rock fondly in High school, and so many more. Obituary & Candlemass was most likely who I was listening to one day when I flipped the dial for a second & Black Uhuru's RED caught my attention for the first time around 1990, showing me a different path. I definitely know both genres well, and can tell you that OUTSIDE of the California Art & Wine Festival, 'Cali reggae' is rock music, period. As far as what the artists say about it, I have interviewed and gotten to know MANY of them and KNOW what they say about it. These bands RARELY credit reggae music as their influence if you listen to their interviews that even stream during the fest on the internet broadcast. Their newer genre formed from rock bands back East that toured Hawaii, mixed that pot up a little, then that mixed pot toured Cali at a time when Michael Douglas Coke was being extradited from JA and nobody on the Island could get a visa. The only bands left to play were the Indy bands playing Sublime covers, some hip-hop artists, and Don C who lives out here already. Perhaps I misspoke about WHO buys tickets as I don't really know who goes to the show because I don't go myself & just have to take the word that so many others share with me. I could be wrong after monitoring the last 10 years of radio requests & comments from this entire surrounding area, not to mention the HUNDREDS of local garage bands playing 15 minute lead guitar solos growling out lyrics about surfing, but I'd place a money bet that it's not San Jose but SOUTH coastal valley areas primarily buying tickets, can guarantee you that my old metal friends from the CENTRAL Valley already have their tickets, and if you were to poll them on what they normally listen to, it's rock, metal, and West Coast hip hop. I live a 19 minute drive from the venue, and it's still not enough to make me want to go after all these years. I need something with more "substance" personally, so this one is just not for me. Agreed. With the line-up revised as you suggested, I'd not just want to go, but take my family & friends, support the food & clothing vendors, and maybe even give it some additional promotion! These large festivals are capitalism in it's purest form. You have to pay money, and you have to get paid money. These are the bands that will both sell the most tickets and charge the most money. Perhaps the name is somewhat misleading because you don't have much Roots but this is a perfect line up for who you are trying to sell tickets to. It has nothing to do with reggae purity or this and that. It has to do with selling tickets to a fan base and being around for the following season. Spleece n Ninja! totally agreed on both Your descriptions here! word. "Reggae Business" has never been removed from capitalism. I am sure Steel Pulse, Proteje, Kabaka Pyramid, Jesse Royal, Jo Mersa and/or Alborosie would acknowledge that as well. Point is, POV's are "relative" and much of what is expressed on this thread is from POV's that are influenced by having the opportunity to pick and choose based on proximity to much higher frequency of shows within a given region relative to the majority of other regions in the continental US. Edited 1 time(s). Last edit at 01/15/2019 02:42AM by IYah_Trod. Sometimes I wish I had the ability to erase threads , so I don’t have to look at all the negativity. I posted this just like any other show but I don’t particularly like this festival either. I just posted it. It’s more for the local people who might want to attend. If you are totally against this festival why did you click on this post? It’s a concert poster for a show in northern California. ^^^^^^this^^^^^^ beyond all of this I am sure this would be a great show.. if you like music and not just one kind.. I saw ads on the Bart train today, I like Protoje and Don Carlos. Would anyone pay money to see the other artists esp in an extended festival venue? For the marketing dept at Cali Roots Fest. I really dislike the ads on the Bart trains for Cali Roots. It looks like a skier lady giving a heavy metal rock on sign. Confusing and disconcerting, first thing I thought was what are these d bags selling.